Taiwan cinema's relationship with war and their army have often arrived in ultimately patriotic ways (bordering on propaganda as well). The various Yes, Sir! films stands as examples of this but filmmakers like Chu Yen-Ping have managed to achieve more global poignancy out of local, horrific predicaments and practices via in particular A Home Too Far. Getting by this time award winning Shu Qi (Best Supporting Actress for Viva Erotica at the Hong Kong Film Awards) on board for A Home In My Heart, Yip Hung-Wai has created a movie more in tune with aforementioned Chu Yen-Ping film than any Sir-movie. With a strong central theme of religion, I'm sure what's on display is bound to annoy someone but there's a balance struck here. 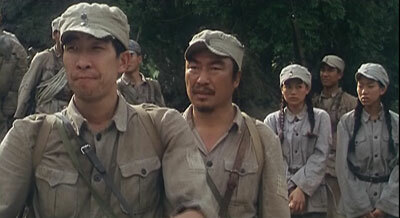 Despite leaning heavily on higher up beliefs, Yip Hung-Wai gets across the importance of journeys, the horrors of war and just how bad direction can come off when you've got no grasp of sentimentality or little to none when it comes to the actor-direction. Somehow Home In My Heart resonates despite. Gels somewhat even. Journeys in question come via Lai and Chun who reaches for a challenge in bravery by going into uncharted and dangerous territory. A potential overbearing patriotic side to the film instead comes off as making sense in terms of how Lai and Chun reasons. Getting to face negative facets of life quickly via violence, death and murder, one of the balances struck that I admired was that the belief in God is strong in the duo but that they overall are on a journey where their own strength is in need of being built. You can do all that AND be devoted because Shu Qi's Lai in particular isn't asking God to guide her because she's an inactive shell of a girl. Despite the battleground of war being very local and relatively small in scale, director Yip conveys the tense nature of Japanese presence and certainly doesn't skimp on the acts of violence throughout. Amidst attractive scenery, a tense scenario is being played out, bonds are formed, strengthened amidst the soldiers now with their fellow women supporting, guiding them and despite all these correctly laid pieces, Yip Hung-Wai finely tuned product goes a bit OUT of tune because of poor handling of melodrama. The most intense moments often ring false, the score goes unnaturally large places (the Mandarin rendition of "Amazing Grace" unfortunately is equal to corny usage, both times!) and even the direction actors seems a little shallow. Oh we got mostly serviceable performances on display (aside from Annie Wu who cries and pouts herself through a very unfelt portrayal), decent subtlety when the bond between stern captain of the squad and Shu Qi takes place but little else that resonates within this aspect. Home In My Heart oddly enough survives a whole lot of these dips, even after portraying the Japanese soldiers as extremely cruel war machines because at heart, Yip Hung-Wai has got a grasp of the overall nature of the themes and adding up the elements that work makes for a fairly intelligent, not overbearing (considering the religious theme) war-time. Extras: Mei Ah's useless Databank (containing a cast & crew listing and the plot synopsis from the back of the dvd).